Tim had some rollover vacation days that had to be used up this month, so I thought what a perfect chance for our baby moon. You know that one last trip where you are past morning sickness, not quite so big and miserable, and don't have to find a babysitter. 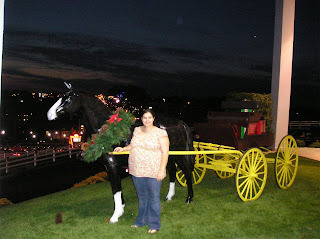 So we decided to take a small trip to Branson. 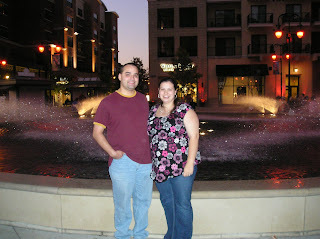 We saw a few shows and did some shopping. 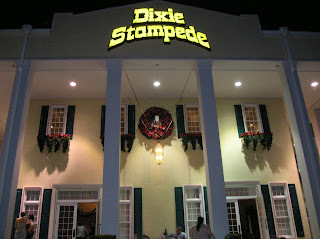 We saw a magician, Kirby vanburch, Dixie Stampede, and Spirit of the dance. We stayed with my former preachers daughter's family, Janet and Nathan. 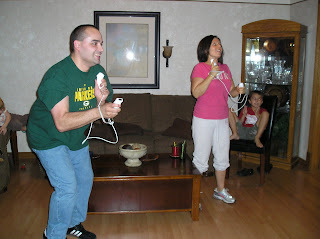 They are so much fun and we had a blast hanging out with them. 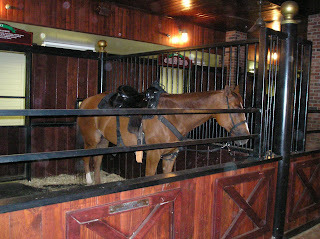 Anyone who knows Tim knows he is quite the ham, no shy man in him. 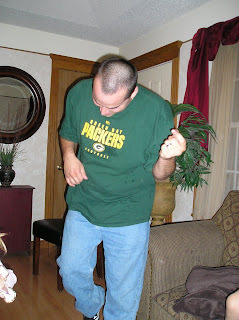 However, if you really want to get him stirred up just break out the karoke, he is always ready to perform. I am not sure what exactly he is doing in these pics, but it looks like a air quitar of sorts, or an irish jig, you make the call. 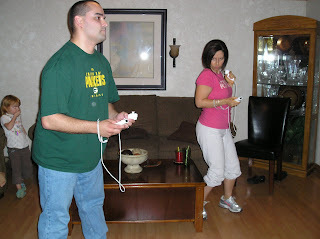 Tim and Janet doing mario racing on the wii. 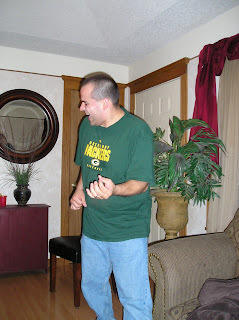 You have to actually run to get your guy to go, by the time it was all said and done, Ithought Tim might have a heart attack, or at least pass out, but it was great exercise. 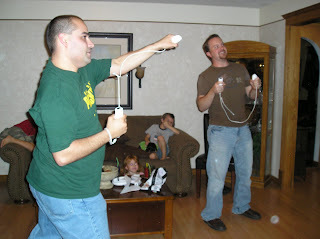 Tim and Nathan wii boxing. 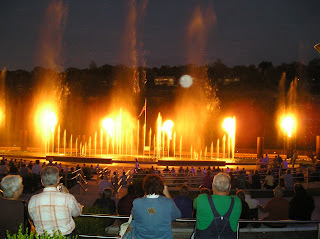 We enjoyed the fountain/fire show at the landing. 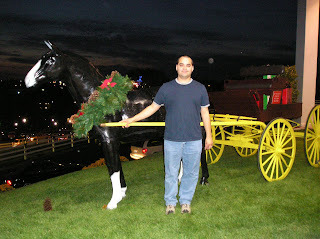 We went and saw Dixie Stampede. This was the first time for both of us, I thought it was good. 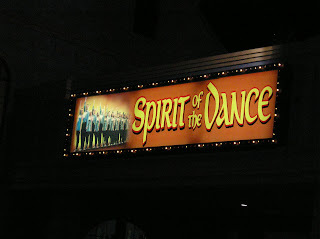 Our last show we saw was spirit of the dance. We ended our vacation on Sunday. 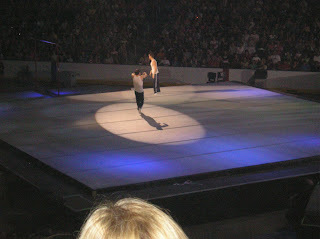 We actually were back in town about 1:30 that morining, but we went to the 2008 Olympic All Stars tour at Alltel Arena. This was between church, so we were at both services for those wondering. 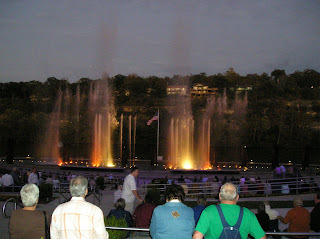 The show was awesome. 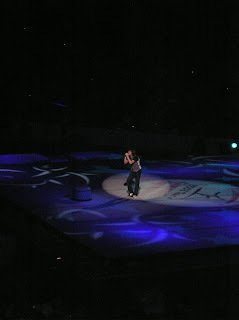 I remeber staying up late watching them in Bejing, so it was cool to see them right in front of us. This is the male co-star from Hannah Montana, I forgot his name, but he was the opening act, and all the little girls were screaming and going crazy, it is funny to think that maybe I used to be like that. Somehow I missed A pic of Nastia Luken, but she was there too. Shawn Johnson balance beam routine. I'm jealous of your "Olympics" experience-- how awesome! We are ready to stroll.